There's something charming about someone whose maiden name was Rainbow! And like many of her heroines, she was a nice English vicar's daughter. She's credited with inventing the modern romantic suspense novel, so I'm grateful to her not just for her books but for the many stories in this genre that I've enjoyed since. I haven't read these books since late primary school/early high school so needless to say they're dim memories to me in terms of plot detail, if not in terms of how fondly I remember them. I still recall some of the wonderful landscape descriptions for which Mary Stewart is so famous. The midday heat and the cicadas and the scent of fragrant herbs in the South of France from MADAM, WILL YOU TALK? (1954), for example. I blame Mary Stewart for at least part of what spurred me to travel - do you think she'll refund some of my airfares? The people next to our farm were considerably better off than we were and had a library. To a bookish young 'un like me, that was the height of sophistication. And they were Mary Stewart fans - I still remember them lending me beautiful hardcover book club editions of books like AIRS ABOVE THE GROUND (1965), about the Lipizzaner stallions in Austria. Ah, memory lane! That's right, you wanted a review, didn't you? My friend Annie West is a great Mary Stewart fan and has read the books a lot more recently than I have. My copies are long gone, but Annie snaffled WILDFIRE AT MIDNIGHT and MY BROTHER MICHAEL for me for this review. 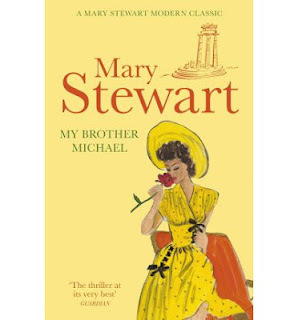 MY BROTHER MICHAEL (1959) was the first Mary Stewart I ever read. It somehow got mixed up with the box full of category romance we brought back from the book exchange that particular year. I loved it - I must have been about ten and I'd never read anything like it. And I loved that I learned things from it. Geography and history and art and mythology, for a start. Our wide-eyed but far from silly heroine, Camilla Haven, flees a broken engagement in England to visit Greece. When the book opens, she's writing a letter to a friend saying nothing exciting ever happens to her. Be careful what you wish for! A stranger rushes into the cafe and gives her the keys to a car due in Delphi on a matter of life and death. Camilla seizes the opportunity for adventure and sets out for the unknown. The unknown turns out to be danger and violence, and a meeting with the attractive but enigmatic Englishman Simon Lester. Simon is in Delphi, searching for the truth behind his brother Michael's mysterious death during the Second World War. Ahead of us the mountains thrust that great buttress out into the valley, the river of olive-trees swirling round it as the water swirls round the prow of a ship, to spread out beyond into a great flat lake that filled the plain. High up, in the angle where the bluff joined the mountain, I saw it, Apollo's temple, six columns of apricot stone, glowing against the climbing darkness of the trees behind. Above them soared the sunburned cliffs, below was a tumble, as yet unrecognizable, of what must be monument and treasury and shrine. From where we were, the pillars seemed hardly real; not stone that had ever felt hand or chisel, but insubstantial, the music-built columns of legend; Olympian building, left floating - warm from the god's hand - between sky and earth. Above, the indescribable sky of Hellas; below, the silver tide of the olives everlastingly rippling down to the sea. No house, no man, no beast. As it was in the beginning. You can see why writers rave about her descriptive powers, can't you? This is so vivid, you feel like you're there. The second book I read for this review, WILDFIRE AT MIDNIGHT (1956), follows a much more conventional form. It's basically a country-house murder set on the Isle of Skye in the Hebrides. I've been to Skye, and take my word for it that Mary Stewart perfectly captures the slightly creepy but breathtakingly beautiful atmosphere of this place, especially in the shadow of the Cuillin Mountains. Our less wide-eyed heroine Gianetta Brooke goes to Skye to recuperate after a difficult divorce from handsome rotter/writer Nicholas Drury. And what do you know? Nicholas is staying in the same hotel! There's quite a high body count in this one, but the story is compelling and while the romance gets less space, it's effectively done. And Nicholas does a lovely grovel at the end (I don't think I'm spoiling it for you by saying that!). You can see there's a pattern to these books. Lone woman out of her comfort zone thrown into danger and adventure and forced to sink or swim. Through her courage and initiative (both these girls are pretty stalwart, for all that they look like fragile English roses), she solves the mystery and emerges worthy of true love. Actually speaking of true love, I really could have done with a bit of kissing in MY BROTHER MICHAEL. What can I say? I'm shallow as a puddle at the Parthenon! True to their era, there's not a lot of naughty stuff in these stories although there's excellent sexual tension. Both books were excellent reads and featured rather gothic heroes - because the books are in the first person, the heroes' motivations are opaque for most of the stories which increases the tension considerably. If you're interested in dabbling in old-school romance and you want to sample beautiful writing and exciting tales, I'd highly recommend either of these. Re-reading them after all this time has definitely whetted my appetite to return to Mary Stewart. Have you read Mary Stewart? Do you think she still holds up today? Do you have a favorite? Are you a romantic suspense fan? Any recommendations? Gosh, writing styles have changed. I must admit I prefer my language less flowery, if that's the right word. I like a fast paced story and perhaps that's my life being reflected in what I like and how I like to read. It doesn't mean I can't appreciate the fabulous writing. Bron, I was talking to a friend of mine who has been to Delphi and she said that's exactly what it's like. Wonderful that she captured it so incredibly. I have to say I miss elements of the old books - I like the way they'd often take their time to explain or describe things. Not saying I always want that but it was refreshing to read something that wasn't a gasp a minute. Hi Anna, what a treat to read about Mary Stewart's books. As Bron says, the pace is slower than in more recent novels but boy, the tension is there and atmosphere in spades. Like you, I blame Mary Stewart for my travel bug. I read 'The Moonspinners' at an impressionable age and adored it, and Crete as sge described it. I'm sure that's one of the reasons I studied classics and Greek - for an excuse to travel there. 'Airs Above the Ground', set in Austria with spies and fabulous horses and deep mystery is a treat, and so is 'Madam, Will You Talk' about a man on the run who falls for the woman whose doing all she can to stop him reaching his goal. Set in the south of France it's a wonderful treat and again, cemented my resolve to visit. Oh, yes, and 'This Rough Magic' on Corfu with all sorts of mystery and full of references to Shakespeare's 'The Tempest'. Apart from that, as you say, Ms Stewart spurred so many other writers to try their hands at the woman in jeopardy story. And, perhaps strangely for the period she was writing, her heroines don't stand around waiting to be protected - they get out there and take an active role. Love them! Hm, in that last message I meant 'who's' not 'whose' but I'm hoping you'll excuse me, Anna. Annie, I know you're a huge Mary Stewart fan - in fact, I borrowed these books from your comprehensive MS library! Thanks so much for swinging by. I remember Airs above the Ground with the wonderful Lippizzaner horses (I was horse mad at the time). I never read the Moonspinners - must remedy that. I loved that the girls really are proactive but without being at all atypical of their times. Really this was such a pleasure revisiting these books. Hey, what's a typo between friends? Hi Anna, thanks for bring back an old favorite of mine. I have only a few Mary Stewart's under my belt, but my favorite is "Touch not the Cat." I started it the summer before I started college; I loved it! After that I had so much to read that I had to give her up because I had so much university work to do. "Touch not the Cat." puts Mary ahead of he curve because it is one of the first books I remember that has a touch of the paranormal in dealing with telepathy crossing time and place. I think I hav to dig it up and read it again. Thanks for the other book suggestions, too. Flora, I can't remember TOUCH NOT THE CAT. Although it's so long since I read them, it's possible I did read it back in the dim distant. I remember MADAM, WILL YOU TALK which Annie mentioned. Remember the descriptions of the heat of the South of France and the scent of herbs in the air. And I'm sure I read THUNDER ON THE RIGHT and THIS ROUGH MAGIC although don't remember them either. Reading these two has inspired me to go back to her so I'll give the cat a go when I do! Love the sound of the paranormal connection. I used to read a lot of Mary Stewart, but I must say that was a LONG time ago now. I do remember enjoying them. Mary, it's a long time since I read her too. She was very popular here in Australia. I remember my school library had a lot of them. We even had My Brother Michael as a set text in grade nine. Oh my goodness! 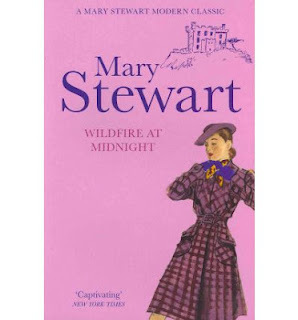 When I saw the name Mary Stewart, I gasped and memories of some of the best books I've ever read when through my mind. I have wondered for a very long time why more authors don't write like this wonderful lady. Her novels are filled with the most amazing descriptions that transport me. Her heroines are strong but ladylike. Her heroes are similar but often obviously need this strong heroine. Couple that with a mystery of some kind that keeps the reader on the edge of their seat and you have a classic Mary Stewart novel. I would love to reread all of her books. Unfortunately, paper versions have gone by the wayside. Thank you so much for this discussion today. You brought back happy memories for me. What an amazing lady. Connie, it looks like there's new editions of the paper ones available now - the covers here are from those new editions. It was such fun for me to read Annie West's old copies, though - reminded me of the books as I originally read them, cheesy 70s covers and all! Love your description of the books - you're so right. And I love that the heroines are strong without being strident. Thank you for another wonderful blog, Anna. I love Mary Stewart! She and Victoria Holt were my intro to romance reading. I'm a big romantic suspense fan. In fact, I stayed up way past my bedtime last night finishing a military romantic suspense story by J.L. Saint (a/k/a Jennifer St. Giles) called Tactical Deception. It's the second book in her Silent Warrior series. I loved it! Anna, I read somewhere years ago that Georgette Heyer and Mary Stewart were the authors most often mentioned as influences by writers of romance fiction. I doubt if that holds true for writers under forty today. It would be interesting to know who has been most influential--or if there is even a pattern of influence equal to that of Heyer and Stewart. I love Mary Stewart's books, and I trace my fascination with Greece in large part to endless rereadings of My Brother Michael, The Moon-spinners,and This Rough Magic. The latter and Wildfire at Midnight are my favorites, but I read and loved them all from Madam, Will You Talk? through Rose Cottage, although I think the last three lack the magic of the books she wrote in the 1950s and 1960s. Janga, we've spoken about how wonderful Mary Stewart is before. It was one of the things that made me want to revisit her and see what a MUCH old Anna made of those books that enchanted me when I was in my early teens. They've still got the magic, I have to say. And I can sure see why they made me want to travel. Her descriptions are absolutely heavenly. You feel like you're there. I read Thornyhold and liked it, but as you said, lacked that special magic of the earlier books. I didn't read the other two of those late romances and I never read the Arthur books. Perhaps because it's such a sad story! I think you're right about under forty being the barrier - everyone I talk to about MS who is over 40 gets a wonderful nostalgic glint in their eyes. I think Heyer has probably maintained her influence but I'm wondering about MS.
Maybe that's where I get my love of descriptions (and characterization). I don't want a book of entire dialogue. I love learning and hearing all the vivid descriptions. Some of my favorites are Wildfire at Midnight, Thunder on the Right and My Brother Michael. Catslady, I adore that I learn stuff when I read Mary Stewart. I sometimes think that books that cut all that extra, interesting stuff are shortchanging readers. I found all the stuff about Greece in My Brother Michael absolutely fascinating, especially the stuff about the statues and the Delphic Oracle. By the way, the stone through which the oracle spoke is now in Castle Howard in Yorkshire. I remember seeing it years ago and thinking how sad that it wasn't where it was supposed to be. I have never read Mary Stewart, are her books hard to get hold of? I do enjoy learning new things and reading a romance at the same time. Dianna, many libraries have extensive collections of her books as well. PJ, I'd be really interested to know if she's still popular in libraries. She was a mainstay back in the day! Dianna, there seem to be brand-new editions. Here's the link to the Amazon page: http://www.amazon.com/gp/search/ref=sr_tc_2_0?rh=i%3Astripbooks%2Ck%3AMary+Stewart&keywords=Mary+Stewart&ie=UTF8&qid=1337902654&sr=8-2-ent&field-contributor_id=B000AP6YNC And here's the link to the Book Depository page: http://www.bookdepository.co.uk/search?searchTerm=mary+stewart&search=search Looks like there aren't many e-book editions, though. They're definitely an older style romance but I thoroughly enjoyed re-reading these two. I have not read her books before but maybe I sould look for them. Quilt Lady, I definitely think there's an old-fashioned element to them but I thought these were excellent reading. I must have a dozen Mary Stewart books sitting there waiting for me. Disney made a movie of Moonspinners back in the late 50's early 60's. When I found out who wrote the book it was taken from, I started buying them. With college and a stint in the Peace Corps, I didn't get to read them. They are part of my great TBR Mountain which grows daily with all the good books and authors I am discovering here and a few other places. Daphne du Maurier is more gothic, but a favorite. I have a shelf of her books too, some read, some not. There was one author I did manage to read in college, Helen MacInnes. She wrote espionage often involving women who were pulled into the intrigue. I need to find those books of hers I have and reread them. It will be interesting to see how they have held up, or not, since the 60's. They were Cold War based and Russia was the big enemy. I am a big fan of romantic suspense. There has to be more than just a relationship in the story to keep me interested. Thanks for the trip down memory lane. Pat, I smiled when I read about your never-ending TBR pile. Clearly we share a book-buying gene somewhere. I can't remember seeing the Moonspinners although it's highly likely that I did - we watched Disney religiously when I was growing up. DDM was another favorite. I'm actually thinking of dragging Rebecca off the bookcase and reading it again for one of these reviews. It definitely falls into the classic basket and I haven't read it since I was at school. Suspect I'll be less gaga over Maxim De Winter than my teenage self was! Funny you mention Helen MacInnes. Annie West, who lent me the Mary Stewarts, really liked her stuff and we were talking about it on the weekend as reading fondly remembered. I don't think I ever read her - she was definitely in the school library, though. Thanks for swinging by and wandering down memory lane with me! Thanks to everyone who swung by to talk about Mary Stewart. It's been great fun! See you next month. I'm doing a great young adult called WARPED that's currently up for a RITA. Well worth a look! Thanks for the trip down memory lane, Anna. I adore Mary Stewart. Along with Heyer she turned me on to romance. This Rough Magic is my favorite, I think. I love the Corfu setting and it has a couple of really scorching kisses for those of us who enjoy these things! I had never heard of the Lipizzaner horses until I read Airs Above the Ground. Her description of both Skye and Delphi are perfect. She achieves a level of sexual tension all writers could learn from. Sometimes the sexiest stories are because of what isn't spelled out for you. Hey, thanks for swinging by, Liberty. I love that you learn 'real' information when you read her stuff. And as I said, she captures that brooding beauty of Skye just perfectly. The sexual tension is wonderful too. I'm so glad I ran across this on Twitter! I have always LOVED Mary Stewart!She doesn't get the recognition she deserves today. The Ivy Tree is a great work of literature, not just of romantic suspense. I loved Touch Not the Cat and of course her Arthurian series. She has a great sense of history. I've never stopped reading her over the years. She most definately influenced my novel Soul and Shadow. No need to wonder why it's romantic/historical/paranormal-all Mary Stewart territory.It's sad that she's fallen out of style. Our library has only one of her books! When people ask me who is my favorite writer in my "genre"(good books transcend any genre IMHO)and I tell them, I get blank looks. It's time for a Mary Stewart Revival!! Susan, how sad about your library only having one of her books. When I was growing up, she was tremendously popular and the libraries were full of her. She's definitely due a revival! I think the writing is just so beautiful. There were whole slabs I could have quoted that were just as lovely as that Delphi piece above. Wonderful that you're a fan. I need to re-read the others now. I really had forgotten a lot of My Brother Michael although there's an absolutely magical scene in the cave that I hadn't forgotten and I thought, 'ah!' when I came to it again. You know the one I mean! I own all of Mary Stewart, Georgette Heyer AND Helen MacInnes. They're my top three picks and I re-read all of them every year. They're the authors I worked to emulate when I was first starting out. Wonderful, wonderful stories. Anny, it's really interesting to return to the classics in the genre, isn't it? I've been slowly re-reading the Georgette Heyers (and reviewing a lot of them here - recently did Faro's Daughter and Sylvester, both great reads). I think Mary Stewart was a major influence on the romantic suspense genre - she got the balance just right, didn't she? I never read Helen MacInnes. Perhaps I should seek her out. Loved HelenMacInnes' 'Friends and Lovers' - my favorite. Mum loveed Mary Stewart and when her eyesight failed around 85 I used to read them to her. Mum died at 90 and died in 1995 and then I wrote to Mary and told her how much enjoyment her books gave my mun - Mary graciously wrote back and now I treasure her kind reply- Mary said she has never lost her Christian faith! Tony Behan, Brisbane, Australia. Mary Stewart was my favorite author in my teens. Though styles have changed, a serious romance reader (actually, a serious romance WRITER) would learn much from her books. I loved all of them (except the Merlin departures) but my favorite by far was the first one I read, The Ivy Tree. I read it in the back seat of the car on the way to a family vacation, and when I finished - gasping in awe at the play on words once I 'got' it - I started back immediately on page 1 and reread it, all in the same sitting. And it didn't hurt that my name (though not spelled the same way) was the mc's name, too!